NOCN qualifications are flexible and responsive to learner needs and credit based, consisting of individual units of assessment, each with an assigned level and credit value attached. Learners who demonstrate that they have achieved the learning outcomes of a specified unit are awarded credits and can collect/accumulate these over time towards the achievement of a full qualification. Ofqual - the qualifications regulator - recently finished a consultation called 'After the QCF - A New Qualifications Framework'. This concluded that the Qualification Credit Framework (QCF) used for the regulation of vocational qualifications should be replaced with a new single and simple to use framework, called the Regulated Qualifications Framework (RQF). The change has now been made and the RQF has replaced the QCF. All new qualifications will now be regulated through the RQF. OfQual states that the RQF is more descriptive and less prescriptive than its predecessor. This flyer from Ofqual explains the change over. 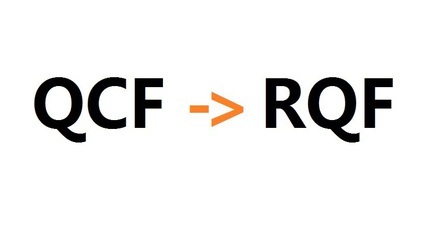 The term 'QCF' will be removed from all qualifications. Any new qualifications will no longer have QCF in their title. All existing qualifications will be updated to RQF by December 2017. Guided Learning Hours (GLH) will be replaced with Total Qualification Time (TQT), which includes GLH, assessment and self-directed study time - indicating the size of the qualification by the total amount of time a learner is expected to take. You don't need to worry or do anything. NOCN still has a great range of qualifications available in many sectors. These changes will be phased in over the next two years. The end result of all this change is that you and your learners will get a much better product. NOCN has launched a new style qualification designed to meet the criteria of the RQF. This is called MY-VOC and represents a new, flexible approach to qualification design to better meet the needs of employers and learners.